Why the mystery around company leadership and the VPN protocol? Many VPNs promise to “unblock the world” by opening up foreign streaming sites, or domestic ones when you’re overseas. Hong Kong-based X-VPN does a good job of living up to its unblocking promises. It offers a fair number of locations and servers, as well as dedicated streaming servers for the U.S., UK, and Australia. Each of which is specified by country and the service it aims to unblock such as Netflix, Sky Go, BBC iPlayer, Hulu, and Australia’s 9Now. 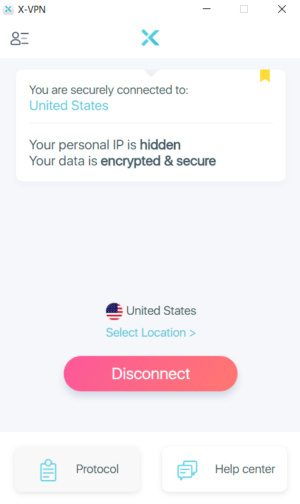 When you first open X-VPN on Windows it shows some key information such as your current IP address and general location at the top, a message about whether your connection is encrypted or not, a big Connect button towards the bottom, and options for changing your VPN protocol and getting help. An active connection in X-VPN. 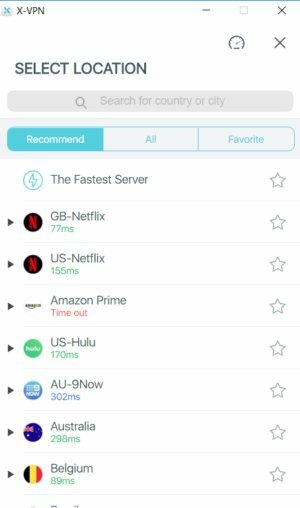 By default, X-VPN will connect to the fastest server based on your location. Otherwise, you can click the Select Location link to choose from its 28 country locations. The screen where you select the server location has three tabs, one for recommended servers, for all servers, and for your favorites. There’s also a speedometer icon at the top right to run a built-in ping test to see what kind of response time you can expect from all listed servers. Oddly, the All and Recommend tabs list the same servers. The only difference is that All lists by category and location whereas the Recommend tab lists servers mostly by alphabetical order. At the top of All is the Videos & Music category that lists all the services X-VPN unblocks including Netflix U.S. and Netflix UK, Amazon Prime, Hulu, Pandora, 9Now, BBC iPlayer, and Sky Go. After this section, the remaining server locations are listed by global region such as the Americas, Asia Pacific, and so on. In my tests, X-VPN worked well for Netflix, Hulu, and Pandora. The international services also appeared to work, though I didn’t test them in depth. Anyone who wants to drill down beyond the country category can do so by clicking the black arrow to the left of each location. There are five servers for U.K. Netflix, for example, and three in Canada. Going back to the primary screen of the app, clicking the icon in the top left shows the app’s settings, which are minimal. There are options to start X-VPN on boot and Application Control, a feature that automatically disconnects selected apps when you are not connected to X-VPN. One odd feature of X-VPN is its Protocol option at the bottom of the main screen. X-VPN has eight different “protocols” to choose from but the VPN doesn’t provide any technical details about them such as what VPN protocol and encryption standards they use. Instead each protocol has a letter designation such as “Protocol A,” “Protocol B,” “Protocol C,” and so on. 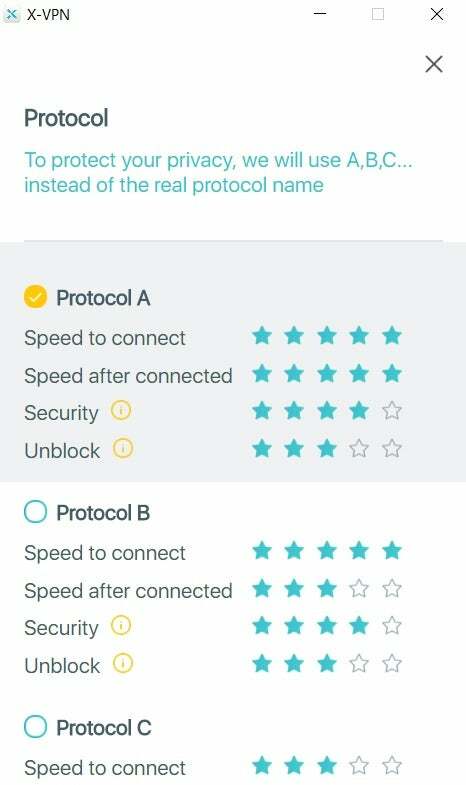 Each protocol uses a five-star system to rate its speed to connect, speed after connected, security, and ability to unblock. X-VPN says it doesn’t provide details about the protocols and encryption standards it’s using for each option in order to somehow protect your privacy. If my editor allowed me to use the eye roll emoji I would put it right here. X-VPN is owned by Free Connected Limited, which is based in Hong Kong. Its business address is Suite A40, 9/F Silvercorp International Tower, 707-713 Nathan Road Mong Kok, Kowloon, Hong Kong. As for public leadership, I didn’t find any using the usual searches, and when I asked the company for information, it declined to provide any. My position on anonymity from company leadership should be well known to anyone regularly reading our VPN reviews. Although VPN services are all about privacy and pseduo-anonymity for the user, it’s also about trust and that means being able to point at a company and know who’s behind it. That isn’t happening here. X-VPN’s server selection after running the ping test. It does collect your email address, which it requires to create an account, as well as your registration data, subscription status, and payment method. All standard stuff so far. X-VPN will also record your iOS and Android ad identifier numbers on mobile. X-VPN says it also collects data in aggregate, including your operating system, the app version of X-VPN you use, total data used for the month, and location information. On top of that it also records the server location you used, connection time stamp, any error reports, protocol used, and the network type you used to connect to the service. That’s not terrible, but not the best we’ve seen either. If all you’re concerned about is that it doesn’t follow you around the web then it should be enough. Privacy and anonymity maximalists should look elsewhere. 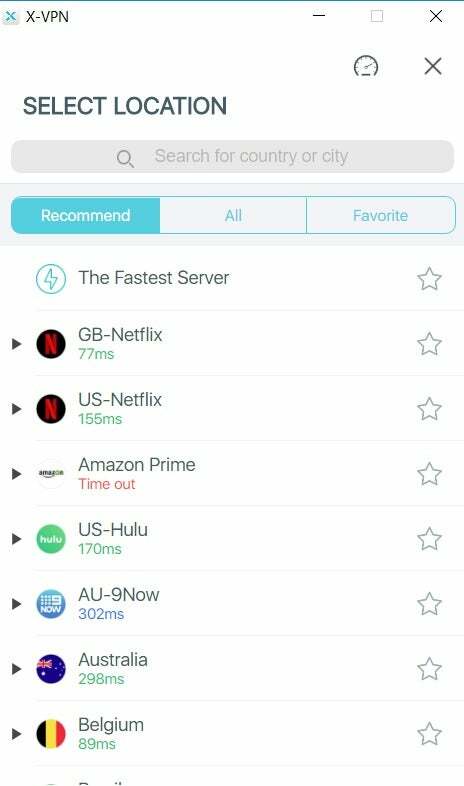 In our tests, X-VPN was pretty good but not standout. On average it maintained 31 percent of the base speed overall using five country locations. That puts it in the middle of the pack among the VPNs we tested. It will do the job for streaming and other needs, but there are faster VPNs out there. X-VPN gets the job done, but a lack of transparency about who’s behind the company, and the use of a little-known VPN protocol make it something of a risk for users. For that reason, I recommend looking elsewhere for a VPN with a well-known track record of reliable service and one that offers more information about company leadership.